Penn's Conquer Saltwater Spinning Reels are ready to rumble with EAS (Easy Access System) that lowers the maintenance hatch to access key internal parts for maintenance and lubrication, Eternal Alloy spool lip that resists dents and scratches, Superline Spool, patented one-piece machined aluminum gear box, forged anodized aluminum spool, machine cut alloy main gear, HT-100 drag washers, 10 shielded stainless steel ball bearings, and instant anti-reverse. ""I purchased the Conquer from BPS with the idea of putting it on a 7'6 Star Lite rod (split fork grip)...however this must be the hottest rod in Florida...they are always sold out when I go to the store. " "I have fished penn reels for years, and this one meets or exceeds my expectations. I put this on a St. Croix Inshore Mojo 7'6" ML rod and spooled up with Suffix 832 10# and love this combination for redfish and trout!" "I have the 5000 and 7000. 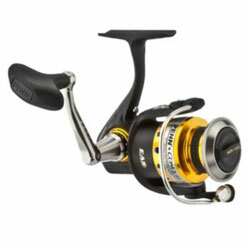 I love these reels! Very smooth, cast great, smooth and powerful drag... can't say enough about them."